PR is becoming increasingly important in every area of business, meaning comms directors are making integration a priority, according to this year's PRWeek/ Brands2Life Comms Directors Study. Alex Benady looks at the study's key findings. "Marketing has become PR," proclaimed one delegate at PRWeek’s PR360 Summit a couple of months ago. Could that argument now be taken a step further? In the light of findings that according to comms directors, PR skills now inform nearly every function in business, could it be that business is becoming PR? The very least we can say is that the ‘PR-ification’ of business gathered pace this year, with more comms directors claiming to have involvement in a broader range of business functions than ever before, according to the tenth annual PRWeek/Brands2Life Comms Directors Study. 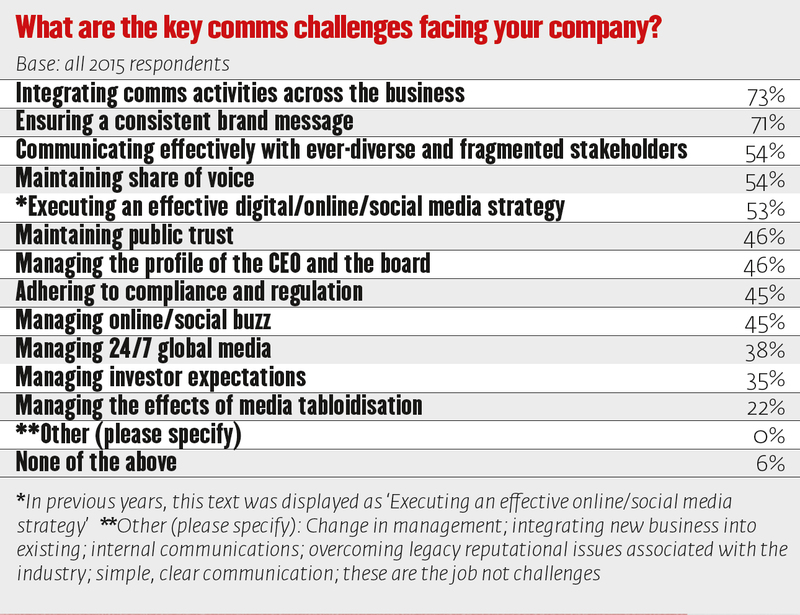 The survey of 100 comms directors found the most pressing challenge facing them today is integrating comms activities across the business. 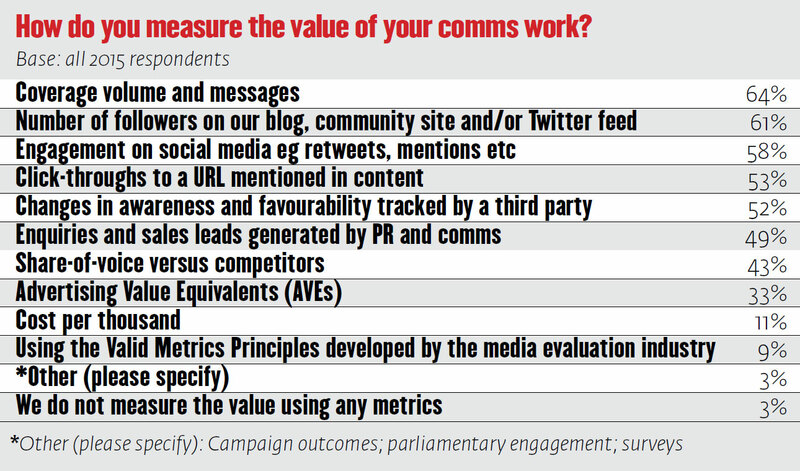 Seventy-three of the 100 comms directors surveyed put this issue at the top of their to-do list. And 82 per cent said they were now integrating their comms across all the marcoms disciplines compared with 73 per cent last year. This marks an increase of nearly two-thirds since 2009, reflecting the way that digital and social media have made comms a pervasive issue in almost every department of business these days. They range from the obvious – marketing, sales and HR – to the less obvious departments such as product development, legal, IT, finance and distribution. "Digitisation has broken all the siloes," says Giles Fraser, co-founder of Brands2Life. "It provides a feedback loop for almost everybody in the business if they choose to use it. That’s why comms directors are saying they have a more strategic role in business and get more involved in decision-making." Increasingly it seems comms directors are thinking of PR not just as a dep­artment but as an all-pervasive business tool. "The post of comms director today is one that can clearly be carried out in many ways. From the postman who protects and distributes the mail to the individual working at the strategic heart of the organisation," says Peter Cross, comms director of John Lewis. "Understanding of the power of good comms will invariably vary across the organisation but once the integration piece is over, when done well, comms can also act as the ‘sticky glue’ bonding some of the other bits together." This mission creep is just one of the reasons ‘ensuring consistent brand message’ or integration was cited as the second biggest challenge by 71 per cent of comms directors, compared with 43 per cent last year. "The extent of functions has evolved but the range of involvement has become ever more subtle. We wouldn’t always lead in those [new] areas but we do collaborate to ensure consistency of message," says Adam Barriball, corporate comms director at Tata. Another reason for the growing importance of integration may be the fragmentation of media, suggests Fraser. "We think that the digitisation of channels has made it harder to get one message across all channels," he says. ‘Mission creep’ may also explain why comms appears to be becoming more internally focused. Seventy per cent of those surveyed said they worked with HR, compared with 49 per cent last year, while 55 per cent said ‘staff communicating the message’ was a big issue compared with 42 per cent last year. The growing significance of internal audiences is also reflected in answers to a question about the most important aspects of the corporate comms remit. 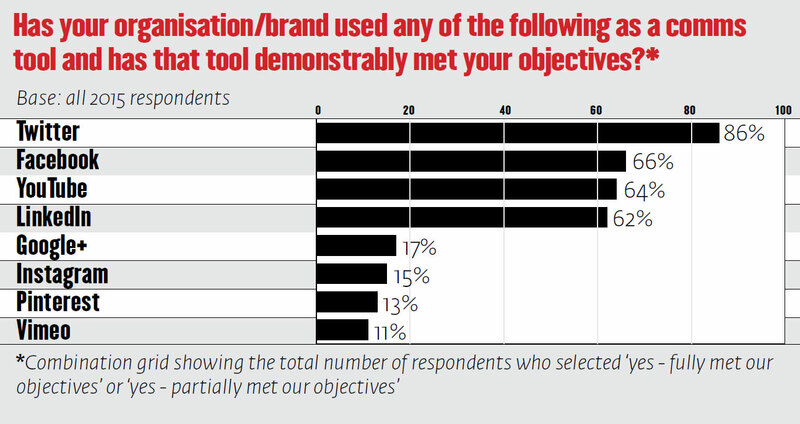 ‘Making sure staff know and communicate the corporate message’ came top with mentions by 55 per cent of res­pondents. ‘Helping shape the overall corporate strategy’ came second, with 45 per cent of respondents mentioning it compared with 35 per cent last year. "Many organisations have undergone significant change rec­ently and leaders need to communicate with workers," says Barriball. He adds that internal comms are increasingly seen as the first step in external comms because "employees are the ultimate brand advocates". Inevitably this means that more traditional aspects of PR are declining in relative importance, according to respondents. ‘Managing the company’s news and building positive media’ fell from 70 per cent two years ago to 45 per cent, while ‘protecting the corporate brand against crises and issues’ fell from 49 per cent to 39 per cent. But despite – or perhaps because of – its rapidly expanding role, PR budgets are coming under pressure. Forty-one per cent said their budgets had declined this year compared with 31 per cent last year. Only 29 per cent predicted their budgets would increase this year, compared with 41 per cent last year. This could presage a broader economic slowdown, as marketing spends are often a harbinger of future performance nationally. But perhaps these figures should be taken with a grain of salt. If comms directors are to be believed, budgets have been slashed cumulatively by more than 25 per cent since 2009. As industry figures reveal the exact opposite to be true, perhaps comms directors merely feel that their budgets have been cut. Whether they have been cut or not, there is certainly a feeling that budgets are now more accountable. There is still, however, heavy reliance on intermediate measures of outputs, rather than outcomes. Advertising Value Equivalent, though widely discredited as a useful measure of effectiveness, is still alive and kicking. A third of respondents said they used it compared with 23 per cent last year. ‘Coverage volume and message’ was the most used measure, used by 64 per cent of respondents, followed by ‘number of followers’ at 61 per cent and ‘engagement on social media’ at 58 per cent. However, the really good news is the measurement of outcomes is growing faster than that of outputs. Comms directors are increasingly trying to show not only that their work has an effect, but that the effect on the business is demonstrable. The proportion of those using ‘click-throughs to a URL mentioned in content’ increased from 38 per cent to 53 per cent. ‘Changes in awareness tracked by a third party’ increased from 47 per cent to 52 per cent. Most significantly, the number of comms directors who now use ‘enquiries and sales leads generated by PR activity’ has more than doubled from 24 per cent to 49 per cent. And it looks as though more would like to adopt this harder, outcome-defined approach, but 23 per cent said they just could not get the data. This is the biggest single challenge facing comms directors, says Fraser: "Comms directors have more potential influence across the business than ever. To achieve this they have to do three things. First, develop and communicate a really strong brand narrative. Second, they must work with all key stakeholders to make sure the narrative is communicated effectively. But the single most important thing is the ability to demonstrate measurable effects." The research found that comms directors are dedicating more of their time to digital. They spent an average of 32 per cent of their time on digital this year compared with 29 per cent in 2013. Nearly a third said that it took up more than 40 per cent of their time. However, digital’s share of budget was significantly lower than share of time spent at 25 per cent, up from 23 per cent two years ago. When it comes to digital channel planning, Twitter is by far and away the comms directors’ preferred medium. Eighty-six per cent of respondents said they used it, up from 82 per cent last year. Use of YouTube is also increasing – up from 51 per cent last year to 64 per cent this year, while use of LinkedIn also rose from 51 per cent to 62 per cent. Facebook, however, declined in use from 69 per cent last year to 66 per cent this year. But as Nissan’s comms director Jeff Kuhlman points out in his interview with PRWeek, the rise of digital and social media means directors often have to operate in uncharted waters. Increasingly they have to take risks to make significant impact. 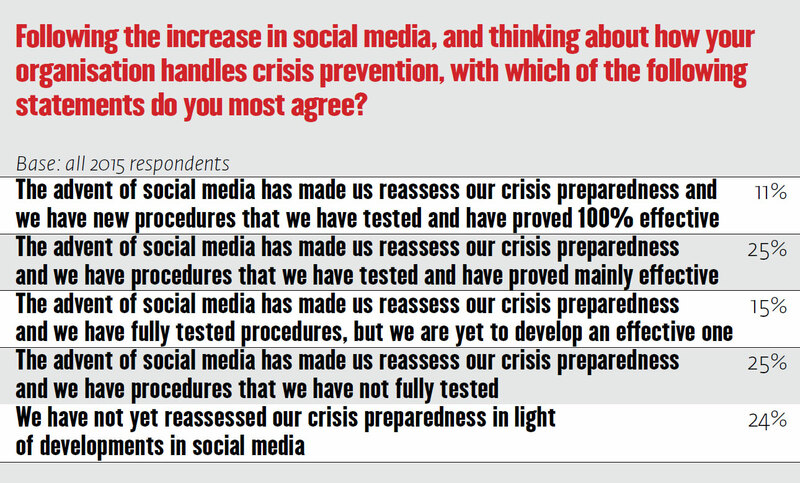 But only 11 per cent said they had put in place and tested new crisis procedures as a result of social media and that they were effective. Twenty-seven per cent of respondents said they knew they needed to take more risks to achieve impact but were afraid of getting it wrong. A further 43 per cent said they knew they needed to take more creative risks and felt that they were heading in the right direction. When it comes to regulation, 42 per cent of the sample thought that there had been more regulatory intervention in the industry this year and only three per cent thought there was less intervention. Thirty per cent thought they were handling this extra burden well, while 14 per cent admitted that they were handling it badly.